Spring patterns are always dictated by runoff from both Sam Rayburn and Toledo Bend lakes. Depending on the lake's salinity, expect to drift over oyster reefs on the south end of the lake with soft plastics, hit the bayous with ultralight tackle for flounder, or work the passes with live bait for large speckled trout. Wade fishing the flats can also yield the largest trout of the year. 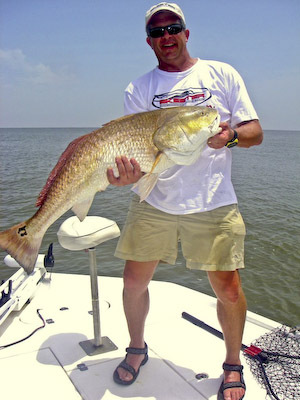 The entire lake heats up as both trout and redfish work over massive schools of shad. Top water action is usually terrific. Fishing slicks in open water provides exciting action. Drifting shad under popping corks is also a consistent ticket for big trout and redfish. Early morning wade fishing is super. These are the magical months for Sabine Lake. Birds work over surfacing schools of specks and reds. Flounder begin their migration out of the bayous, exiting through the main lake passes. Top water and live bait fishing are both excellent options for large stringers at this time of year. Redfish and striped bass action in the river is phenomenal well into the initial freezes of winter. Put on your waders for afternoon topwater action.